We can find in different Masonic web sites the following statement: “The ancient and original orders of architecture, revered by Masons, are no more than three columns: the Doric, Ionic, and Corinthian, which were invented by the Greeks”. 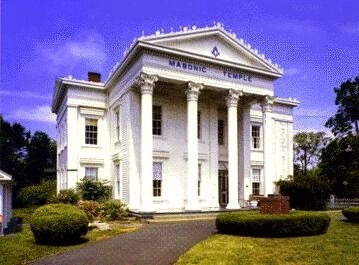 Masons also call themselves ‘architects or travelers’ & call their god ‘The Great Architect of the Universe’. In Masonic symbolism the Doric Column (Columns presented at the 3 D framework on the wall, Lesson 1, Min.3:25) represents ‘Strength’. The Ionic column represents ‘wisdom’ (see this column in lesson1: background of expert Dr. R.C. Sproul, min.39:19). And the Corinthian Column (found at framework in the screen projection, Lesson 1, min 2:55) represents ‘Beauty’. All 3 were used in the presentation of The Truth Project, but coincidentally they are called the 3 pillars of Freemasonry! The 3 pillars are also symbols or ornaments used in the 1st 3 degrees of initiation. (They also sometimes have 2 Roman columns, but their important pillars are only the 3 Greek ones, the most ancient, these are most esteemed by Masons as they recognize in their writings). Early in my Christian life, I was confronted by Jehovah’s witnesses, that claim they have the truth, later I find out sects & cults in general all make the same claim. That’s how many years ago the title of this blog came to be. For this reason the subject of Truth, has been very important to me since the beginning of my Christian life. I used to answer to them, “I don’t claim to have the truth, instead the Truth, Jesus Christ, have me, bowing at His feet”. Even though Jesus said that he came into the world to testify unto the truth (God’s Truth), he also said that HE is the truth (Jn 14:6). The Word of God is the truth (Jn.17:17) and the Holy Spirit is the Spirit of Truth (Jn.16:13; 14:17). I think that instead of focusing on exclusively propositional truth, like they did in the Truth Project’ it is of most importance to learn that: Jesus himself & His word is the truth. All of these made me question. . . whose truth is The Truth Project talking about ? -If they are only teaching ‘worldview’ & not doctrine (as some would like to say ), then why he mentions ‘the truth claims of God’, the bible verses, the prayers and why they claim that it opens and explains the Scriptures in a way rarely equalled. & that it will bring you to encounter God face to face? They even claim that God’s ordination appears to be on this production. (which by the way reminded me of the Jehovah’s Witnesses). But if as they say an encounter with the God of the bible is really their goal , then why the idols & pagan symbols used as truth from God, and why he minimizes that Jesus is the Truth, (Jn 14:6), when the Spirit of Truth always point us to Him? Also if God is Truth, then why in their compass He is not on the North (Truth), but in the East? Masons search for instruction at the east, Mason’s ‘Most Worshipful Masters’ seat at the east of their altars. Their temples face east & even their dead are buried facing east, to revere their god. Their god is at the east because they are sun worshipers, ““As the sun rises in the east, to open and govern the day, so rises the Worshipful Master in the east… to open and govern his Lodge, set the Craft to work and give them proper instructions.” (Duncan, Ritual, page 15). They mainly worship the blazing star Sirius (black sun) that hides behind the sun and represents Horus, the son of Osiris (Ra, Egyptian sun-god) & Isis. In the book of ‘Morals & Dogma’ by 33o degree mason Albert Pike, he connects the worship of sun gods -Baal, Thor and Osiris as identical: “Thor was the Sun, the Egyptian Osiris and Kneph, the Phoenician Bel or Baal. ..” pg.368, Saints Alive in Jesus. Masonic rituals are the same as Baal’s worship (Phoenician sun-god) described in several books of the bible, the same cult confronted by the prophet Elijah (1 King 18). See more on ‘The Doctrine of Jezebel‘. “Then he brought me to the door of the gate of the LORD’S house which was toward the north; and, behold, there sat women weeping for Tammuz. Then said he unto me, Hast thou seen this, O son of man? turn thee yet again, and thou shalt see greater abominations than these. “The compass rose with the fleur de lis is also Masonic. Francis Bacon appropriated the Compass Rose as an emblem of the Advancement of Learning. He was a Rosicrucian, which is complimentary to Masonry.“. The compass rose is a masonic symbol mainly associated with the youth, whom they continually target to indoctrinate. They specially target vulnerable youth that have problems with their father figure, so they can offer them the false security of their brotherhood. The compass is a useful tool for those in a journey. In several Masonic sites they mention: ‘Masons are sometimes called “a traveling man.” ‘They travel East in search of instruction, and then West to propagate the knowledge they had gained’. Every round around the compass (or every step in a ladder), represents symbolically a degree. Interesting enough everyone doing the Truth Project makes one round around the compass. “However, there are a few things about the first tour that rubbed me the wrong way. First, one of the earliest slides that Tackett presents is a compass. On the four ends of the compass are: Truth to the north, God to the east, Social Order to the south, and Man to the west. I found myself chafing against the idea that Truth is due north – it’s what we use to orient ourselves – and God is at another point of the compass.” I agree, it seams like their truth is more important than anything else, even God. Quote from Mr. Tackett on lesson/tour 2 : “Your truth and my truth may be totally opposite and they’re both true.” to opposite truths? That is called Dualism, a very important Gnostic doctrine. On this side, the truth claims of God are consistent and logical.(!? ) They make sense. They work. And even in a fallen world, when we follow them, they lead to peace and prosperity and happiness. (He is talking to the Church, not to unbelievers, but he continually puts God & His Truth at the same level than men). Tackett divided the world in 2 opposites: truth – lies; unity – division, etc. The binary opposites (dualism) is used in many pagan religions & also in indoctrination, because persuades others to choose sides without much thinking, people unconsciously take side with one concept of binary opposition & with their teachers.